At last we have a tooth. I don’t know how common it is, but today I actually got to experience the moment and see the first tooth cut. We were playing and I was on the phone to Nanny when it happened. Addi was being a bit fussy which was out of character. He kept coming over to me and wanting me, but then would distract himself with toys and be happy again. All of a sudden I noticed what looked like blood on his chin. I hung up from mum and went to investigate, thinking he had done something silly with a block he was playing with. I then realised that it wasn’t his chin bleeding but his gum!! I got him to munch on a face washer for a little bit and then put some teething gel on it. Sure enough when I could get a good look I could see that a tooth had cut through his gums finally!!! 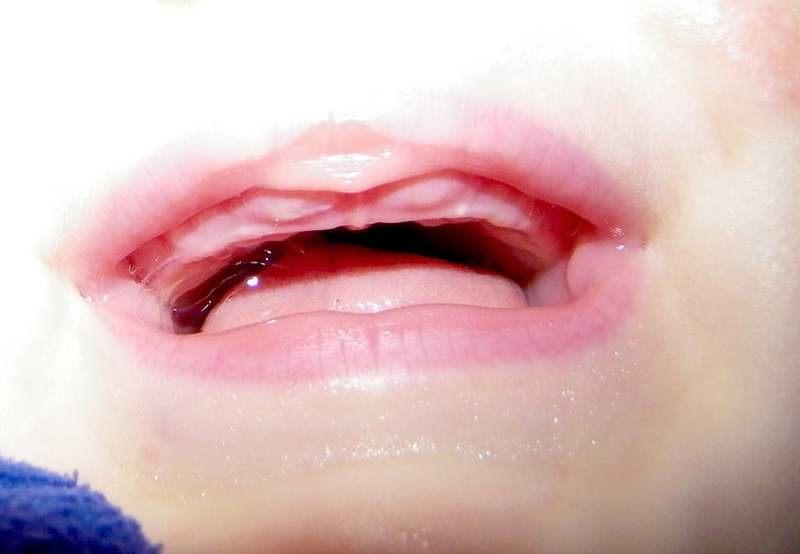 Ok so after teething from about 4 months old, we have a tooth…but which tooth…This is where it gets a little strange! Addison cut his top, right tooth (not the bottom, which generally comes first). No longer can we call him gummy bear. Here is a photo of the tooth peeking through his gums (it’s not a great photo, but hey it is hard to get him to open his mouth let alone take a picture of it!). Hi, Melissa, Wow what a great photo – I agree there wouldn’t be many who actually witness the tooth coming through. And looks like the other top one is about to pop out too. Well done Addi.